Thank you for joining me as we count down to the next MFT release. We are four days away from the big day! All the new Stamps, Die-namics, and Stencils will be available on Tuesday, June 2 at 10:00pm EST. Be sure to check out the MFT Blog to see all the new items being revealed today. Don't forget to leave a comment on the MFT Blog countdown posts, YOU could win one of the five $75.00 gift vouchers. 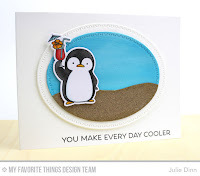 I have three fun cards to share with you today, they all feature the truly adorable new set, Penguins in Paradise by Birdie Brown. I am in LOVE with these little guys! My first card features a fun little fella holding a cocktail. 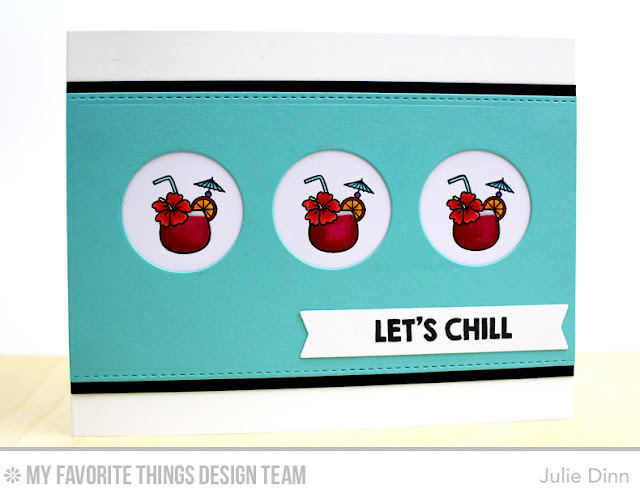 I stamped the image on a piece of X-Press It card stock and I coloured it with Copics. I used the new Zig Zag Stitched Oval STAX Die-namics to create the layered ovals, a little bit of sandpaper to create the sand, and Peerless Watercolours to create the sky. 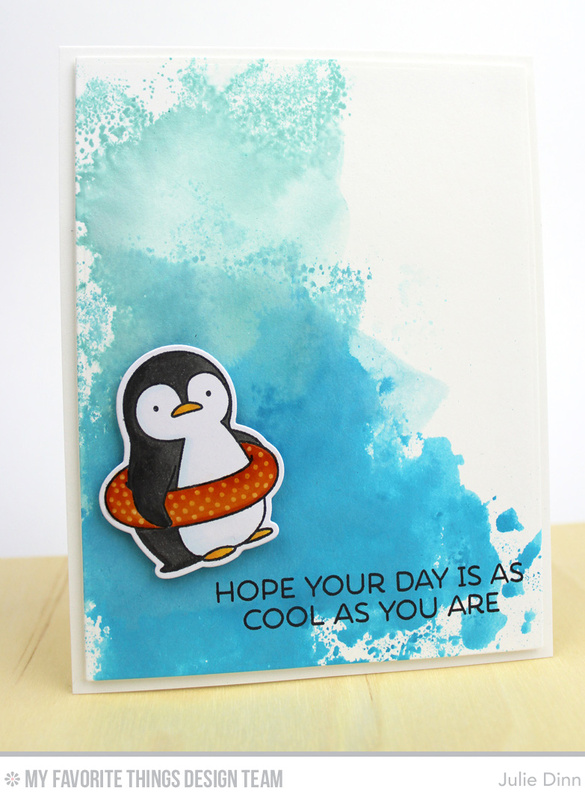 My next card features an adventurous little penguin with a bright orange flotation device. Once again, I stamped the image in Black Licorice Hybrid Ink, and I coloured it with Copics. I added a thick layer of Crystal Effects to the flotation device. To create the splash of colour in the background I used three colours of ink, Summer Splash, Blu Raspberry, and Mermaid Lagoon, with the watercolour smooching technique. 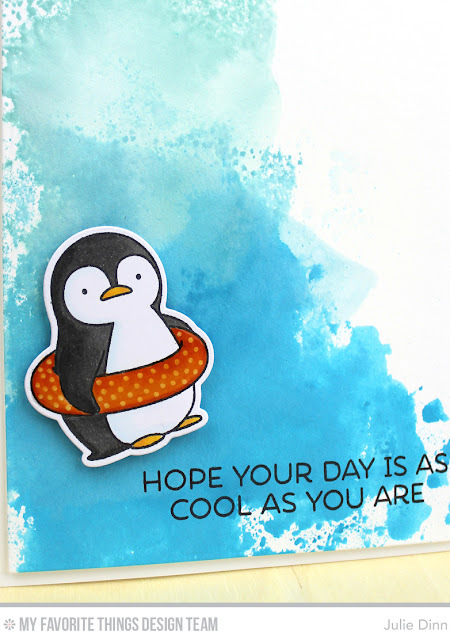 The final card today doesn't feature a penguin, but rather one of the smaller accessory stamps that is included in the Penguins in Paradise stamp set. I paired the fruity cocktail with the Blueprints 23 Die-namics to create a sweet and simple card. The drinks were all coloured with Copics, the flowers received a little shimmer with the Wink of Stella Pen, and the glasses received a thick coating of Crystal Effects. OMGosh these are so adorable. Love all of the cards...but especially the last...a great reminder that all of the stamps in a set can be the star! I love the sandpaper idea. Very cute card. I love your background, is perfect! WOW Julie. These are three awesome cards! You ladies have some wonderful ideas! I already love those little penguins! TFS! You're a great "smoocher" Julie! 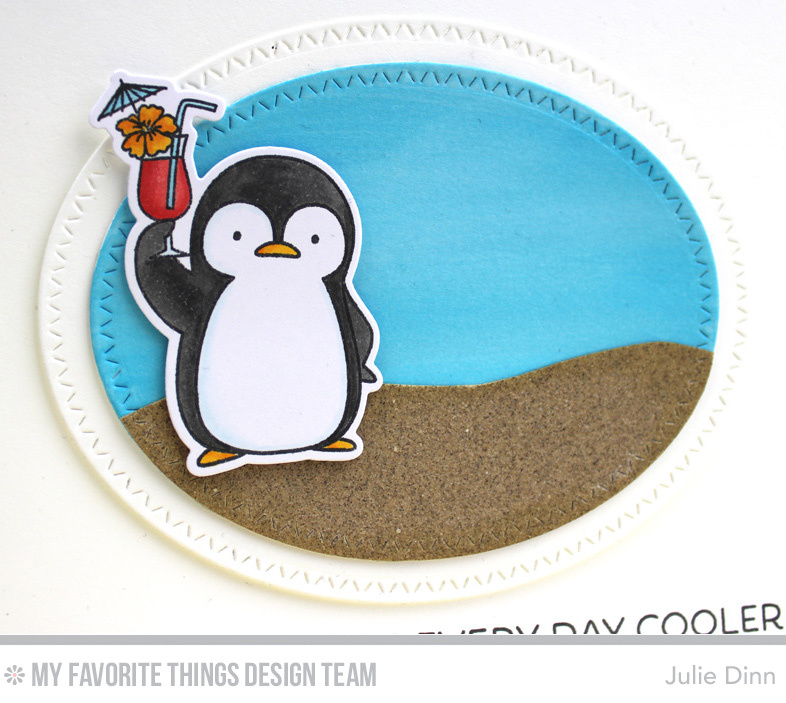 What a cool idea using sand paper for the sand in this card. Love it. Gorgeous cards! Especially love the third! 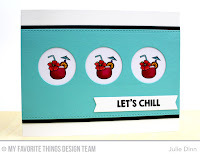 :Love these card designs . Love the splash look of the water color background. You make every card cooler! Love them. Thanks so much for sharing. love that watercolor background and how you used the accessory stamp to make it a featured element on your last card! Julie, these are all wonderful tropical cards. All different but just as nice.